Industrial Networking capabilities have become the gatewayto achieving the enterprise-widecommunication and connectivity that is imperative to remain competitive in today’s marketplace. In this age of information where having constant access to critical data is the key to profitability, networking technologies are being increasingly sought after by businesses as a means to attain fast, secure and reliable data transfer and connectivity and thereby improve organizational productivity. Corroborating this fact are research studies which forecast the industrial networking solutions market to grow at a CAGR of 21.0 percent and reach USD 23.84 Billion by 2022. Organizations today are thus in need of solution partners with an in-depth understanding of the market; that cannot only provide the right networking solutions to meet their needs but also help them overcome various implementation challenges. However, in today’s technology scenario, it isn’t just solution providers and manufacturers that play a major role but also resellers and distributors that are increasingly gaining prominence in the industry. With their technology proficiency, sales and marketing expertise and improved capabilities for storage and logistics, distributors not only help manufacturers take their products to market at a greater speed but also ensure that their products have a wider national or global coverage, thereby boosting their profitability. Moreover, distributors also bring several benefits to customers in the form of improved efficiency, a better assortment of products and routinisation of transactions. One such distributor is Pune headquartered Ultimah Infotech Pvt. Ltd. that has been serving as an end-to-end distributor of IT Peripherals, Networking Products and CCTV Components across India. Established in 2006, Ultimah Infotech began its journey from scratch and has since evolved over a period of 13 years to emerge as a 50 Crore group company that specializes in the end-to-end distribution of Active, Passive, CCTV and Networking products. Founded by Meahul Bbadiyani, a dynamic, techno-commercial professional in the field of Distribution of Computer Networking products, Ultimah Infotech has been equipping its customers with quality products from 7 international manufacturers, along with marketing programs and pre & post-sales support. With its branch offices spread across the regions of Ahmedabad, Chennai, Mumbai, Nagpur, New Delhi, Noida, Gurgaon, Kolkata, Jamshedpur and Hyderabad, as well as global international offices located at Dubai, Abu Dhabi, Qatar and Singapore, the company’s key focus has been on leveraging its technical capabilities, well qualified team, logistics services and customer relationships, to distribute products in the most cost-effective manner and add more value to its customers. “With India developing a new market for technology, we see tremendous potential for growth in the Networking Solutions segment. 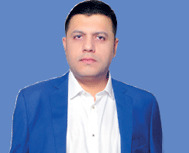 The market requirements today are mainly aligned towards passive networking technologies such as Fiber optic Cables as well as Data Centers and Intelligence Panels,” explains Meahul Bbadiyani, Managing Director and CEO, Ultimah Infotech Pvt. Ltd. “Ultimah aims to meet these requirements, with an added emphasis on bringing value-added services to our customers and providing them with timely deliveries,” he goes on to add. As a distributor for both active and passive networking technology, Ultimah Infotech’s portolio of offerings includes Structured cabling, FTTH (fiber to the home technology), Data Center Management, CCTV cameras, IP Cameras, Switching and Routing, Wireless, Access Point, Security, and Fiber Optic Cables. In addition to networking components, the company has also ventured into the Telecom Sector where Ultimah has partnered with giants such as Reliance Jio, Airtel and Vodafone, to bring Telecom Networking Solutions. Ultimah also serves as a distributor for Acer laptops, Samsung printers and Netgear switches in the Maharashtra Vidarbha region. as a distributor for R&M’s entire portfolio of fiber optics including netscale solutions, passive network components, 19” patch panel, cable routing, installation cables, patch cord, cable assemblies, security systems, keystone jacks, micro switches and tools and testing equipment. Furthermore, with Rack Mount Fiber Panels (LIU) proving to be highly advantageous in terminating and distributing Optical Fiber cables and connecting Fiber Optic Links, Ultimah also caters to R&M’s LIU technology with sliding technology, sliding drawer technology and fiber patch panels at a competitive price. "Ultimah Infotech Began ITS Journey From Scratch And Has Since Evolved Over A Period Of 13 Years To Emerge As A 50 Crore Group Company That Specializes In The End to-End Distribution Of Active, Passive, CCTV And Networking Products"
When it comes to structured cabling solutions, the last 5-8 years have been witnessing the growth of Category 6(CAT-6) and CAT-6A cables and connectors which have become a basic requirement to support data transfer rates of up to 10GBPS and bandwidths of up to 250-500MHz. CAT-6A infrastructures have also grown popular owing to the size and weight of the cable and its ability to future proof networks. Endeavoring to bring these benefits to customers, Ultimah provides R&M’s CAT-6A shielded technologies to facilitate improved line connectivity. The company has also recently begun selling CAT 7 technology, to enhance business and data speed and facilitate easier networking. In addition to distributing leading-edge networking products, Ultimah also renders after-sales support to its customers in the incidence of DOA or other technology damage. The company has an active back support and replacement team that helps customers with damage control and facilitates quick delivery of new material. With this diverse portfolio of offerings, the company at present boasts of over 1600 clients in the networking solutions segment. Having spearheaded active and passive networking products distribution in a period spanning over a decade, Ultimah Infotech has emerged as one of the strongest distributors in this arena and is widely commended for its valuable contributions to the domain. The company which started with a 100 sq ft. office and a turnover of merely INR 6 lakh per year; has today grown to an employee strength of 24, with a 9000 sq ft. multistorey HQ standalone office in Pune and a turnover of INR 60 crores in 2018. Being often compared to the likes of distributors such as Redington and Ingram Micro, it is the company’s focus on providing value-added services, logistics availability and timely deliveries that have helped Ultimah carve a niche in the industry. “Today, logistics is one of the most important aspects of distribution that most companies don’t take care of. Understanding that delivery and downtime are both critical for any IT company, Ultimah keeps a detailed planning of the stock at all times and ensures timely deliveries with aggressive pricing. This has been our USP in the market,” affirms Meahul. Moving forward, the company which has already established a strong presence in India, intends to further expand into Madhya Pradesh and Chhattisgarh, which Ultimah believes to be the biggest upcoming territories for networking products within the country. Internationally, the company also envisions expanding into Sri Lanka and Bangladesh in the upcoming future. Having forayed into Distribution twelve years ago, Ultimah Infotech began its journey in 2006. Soon after, thecompany proceeded to establish its first distribution partnership with Molex Structured Cabling, a leading supplier of structured cabling and fiberoptic connection systems, under the able guidance of Chintak Dalal, the then National Sales Manager of Molex. After serving as a distributor for Molex for 3 years, Ultimah then moved on to form partnerships with ADC Krone, a provider of telecom, wireless, cable, and enterprise network solutions, as well as Switzerland based R&M, which supplies cabling solutions for high-end communication networks. Both these alliances further strengthened Ultimah’s role as a distributor and played an important role in the company’s turnover growth. Ultimah’s next evolution came when the company partnered with industry giants such as D-link India and Cisco Switching through which Ultimah grew its Routing and Switching business. Today, the company stands as one of the strongest distributors of D-link and R&M products across the entire Maharashtra region as well as its global markets. Speaking of Ultimah’s journey to success, Meahul says, “While we started this company from scratch and faced our fair share of struggles through the years, it was hard work, loyalty, strong partnerships, client relationships and my parents’ blessings that helped us grow and succeed.”The founder also named Ramesh Nair from ADC Krone, Gaurav Ahluwahlia of R&M and Amol Deokar of D-link as prominent persons who supported and encouraged Ultimah’s growth.